Dimensions 0.75 by 6.75 by 9.25 in. Amazon.com description: Product Description: The Web is booming, the majority of CGI applications are coded in Perl. For this reason, there is a huge number of beginners and intermediate developers wanting to get to know Perl in general and Internet applications with Perl in particular. Learn Perl basics and get up to speed with Internet and Object Oriented programming with just one book. 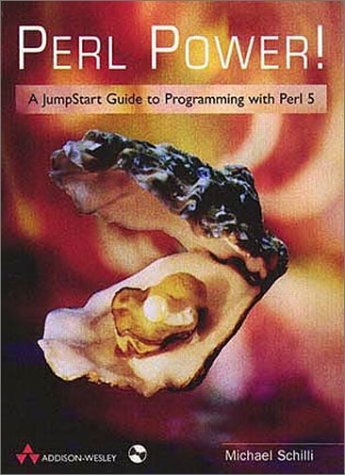 Packed with hints and tips, solutions and exercises, Perl Power! is the perfect jumpstart guide to the hottest features of the latest Perl release. Beginners and intermediate developers an use the intermediate developers can use the introductory chapter to get up and running with Perl 5 fast, and a tutorial on object-oriented programming will supplement knowledge and help to fully exploit the power of Perl. Since use of freely available modules (included on the CD that comes with the book) dramatically accelerates the development of Perl applications, the book shows how to find the right module for common programming tasks and illustrates the use of many of them in detail. About: The Web is booming, the majority of CGI applications are coded in Perl.